Today was a windy, rainy mess and I canceled my charter, a great local fly angler who fishes with me quite a bit. 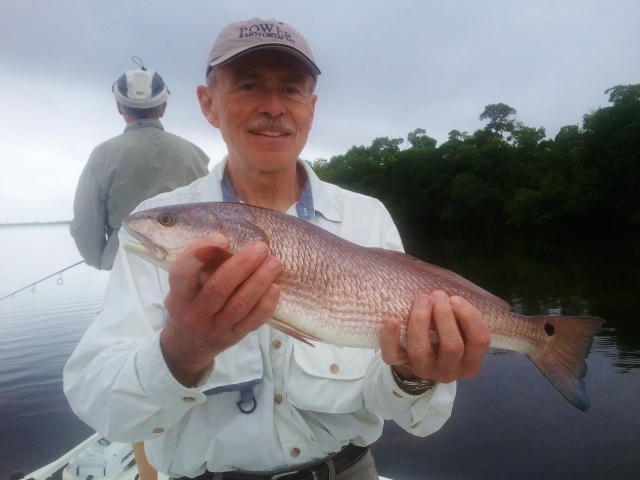 To make matters worse, we had excellent tides and the flats have been covered with redfish. It would have been a fantastic day had the weather just cooperated. Instead of banging my head against my tying desk I cheered myself up a bit by re-reading parts of local author Randy Wayne White's "Ultimate Tarpon Book," which was published in 2010. If you don't own a copy just stop what you're doing and buy one right now. This book is actually a collection of newspaper and magazine articles from various authors, many of which were written between 50 to 125 yeas ago. 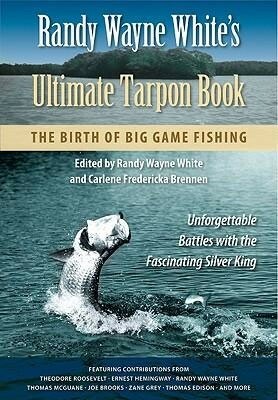 Most of you know Randy White as the Pine Island based creator of the hugely popular "Doc Ford" novels, but I'm a much bigger fan of his non-fiction and "Ultimate Tarpon" is his best work yet. Even though his role here is actually editing together almost 200 different authors, this book tells the history of tarpon fishing in Southwest Florida better than any single writer could have managed. And for those of you who didn't know, the sport was actually started here, not down in the Keys. The very first tarpon ever caught on a rod and reel happened off Punta Rassa, between Sanibel and Ft. Myers, back in 1885. 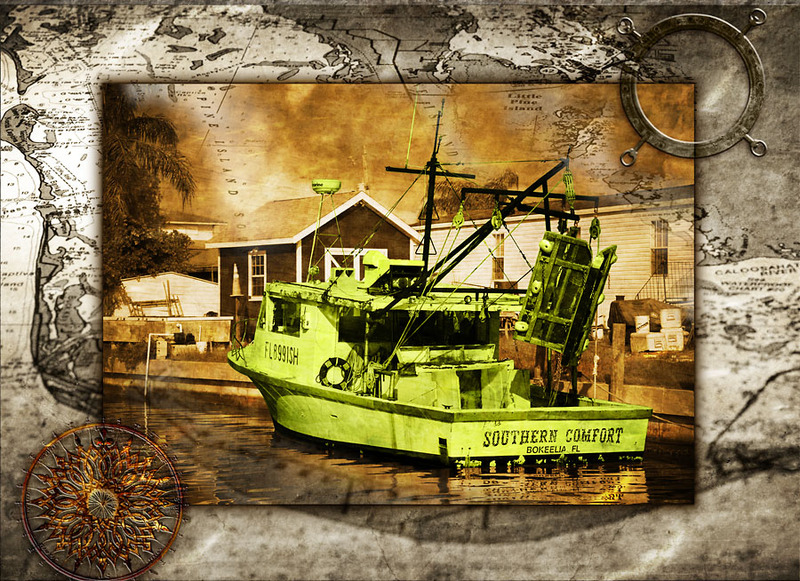 No one even thought of fishing the Keys at that time until the railroad was built almost 30 years later. Even if you're not into fishing, there's tons of great local history on almost every page. Did you know that there was once a four star hotel located in St. James City, catering to wealthy anglers (the only kind of anglers at the time) and their wives? Or did you know that black bear were so common they were hunted on Ft. Myers beach as they dug up sea turtle eggs? Well now you do! I toss out bits of info like that to my anglers all the time while I'm poling them across the flats. I'm probably a lot more interesting to fish with thanks to this book. Thanks, Randy. Bow mounted casting platforms have been around for a long time and I really like fishing on boats that have them. They greatly increase your view when compared to standing on the deck and can add a good bit of distance to your cast, especially if you're fly fishing. The original casting platforms were nothing more than a cooler bungeed to the bow, an idea that worked perfectly from start and really didn't need any improvement. But this is fly fishing we're talking about so something just as simple but more expensive needed to be invented. 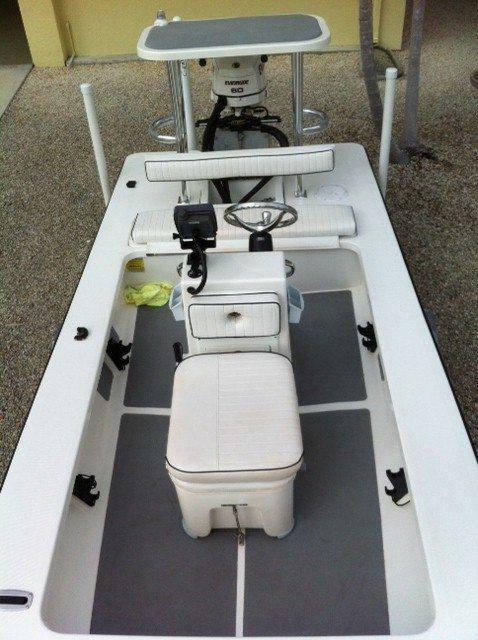 Most platforms are simple devices that come as options from the manufacturer, like this basic aluminum model pictured on a Beavertail Vengeance that also sports a welded rod holder and teak SeaDek. As you can see in this photo it makes using a trolling motor very easy. For rougher water you can incorporate a leaning post like the one shown here on Stu Apte's BT3. Even microskiffs like my buddy's tricked out Gheenoe can make use of them, and the full cage is a must on a hull that's prone to being a little tippy. This particular casting platform works especially well with the remote Minn Kota trolling motor, making this boat the perfect one-man flats skiff for the calm, shallow waters around Matlacha. So as happy as I am with casting platforms and all the things they can do for you, why don't I have one on my own boat? It's a simple answer. As a guide fishing with paying customers I consider them a complete liability. Most of my charters are very competent and experienced anglers but a few times a year I get booked by someone new with absolutely no "sea legs." Just keeping them upright on my bow is enough of a chore and asking them to stand on an elevated platform is an invitation for disaster. My Beavertail BT3 with its 82" beam is one of the most stable flats boats on the market but in the end it's still just a skiff, not a cruise ship. It doesn't take much of a chop to make it pitch up and down even in shallow water. I've been guiding full time for close to twenty years now and in all that time I've only had one paying customer fall off of my boat, an insanely small number that still amazes me to this day. I attribute that to the fact that I've never used a bow mounted casting platform. If you're fishing for fun, by all means try one. If you're fishing for a living, think twice about them. I'm really glad to see that they put together a final season of this show as a tribute to Jose. He was a great guy and everyone who fishes in the Keys owes him a huge thanks. 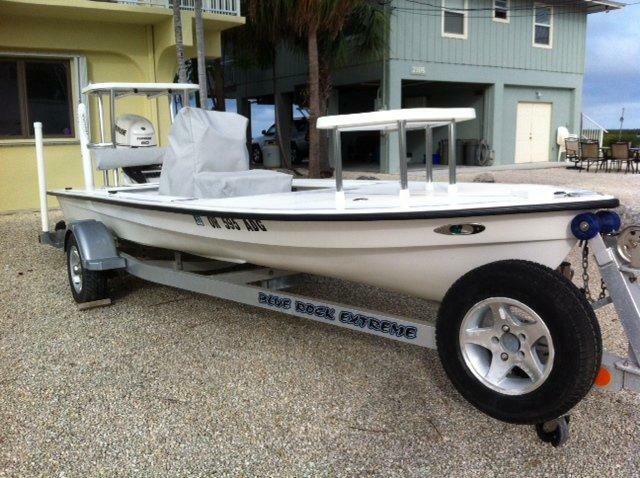 This boat is currently located in Big Pine Key and is in perfect condition. The asking price is $21,000 and you can contact Liz at 941-705-2090 for more information. This actually happend last week on a day when the bite was so slow that I was actually thankful to get anything, even this one. One more reminder to stop by the Olde Fish House Marina starting at 12 noon and check out the entire Beavertail line up. The new Strike that will be on hand is the first one rigged with a 90hp motor so that will be a blast to test drive. See you there. I left the Nikon at home today so the above photo is from my phone. Other than a total lack of sunlight, the weather was excellent and so were the tides. We had a -0.7 low in Matlacha Pass just before 8AM which meant redfish grubbing all over the flats. Local anglers Dan Belongia and his buddy Don came out with me for the first time to look for some tailing fish and weren't disappointed. They landed three nice reds and a 20 inch trouth on both Zara Spooks and Gulps, all in less than 18 inches of water. If the sun would have burned through I'm sure we would have caught more. Great looking forecast for the rest of the week though. This is one of our winter residents who nests in the mangroves just to the north of the island. I see him every day but he was a lot more cooperative about having his picture taken this morning as I was heading up Matlacha Pass with my charter. 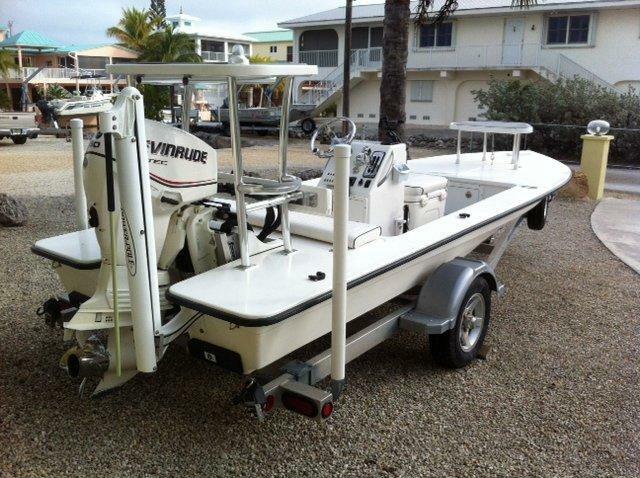 Beavertail Skiffs is Southwest Florida’s premier manufacturer of shallow water boats. Located just up I-75 in Palmetto, they’ve built the last two hulls that I’ve used for my charters over the past six years. My first Beavertail was a 2006 B2 model, a pure sight fishing machine and a dream to pole. At only 550 pounds, I actually bought it to launch right of the beaches on Vieques, PR where I was living at the time. It would float in only six inches and still handled the rough, open waters surprisingly well. No bonefish was safe from us and when I moved back to Florida in 2009 I gladly forked over the money to ship it up here. The B2 was just as effective on the tailing reds of Pine Island Sound and even subdued some huge tarpon in Charlotte Harbor. Unfortunately, it was only rated for 60 horsepower and I wanted to go just a bit faster. Last fall I ordered a new Beavertail BT3 with a Yamaha F70 outboard. This skiff was like a B2 on steroids. It was six inches longer, ten inches wider, but only one hundred pounds heavier. With its extra power I picked up an additional 10mph but still got the same fuel burn as my previous boat with its 2 stroke motor. The most impressive thing of all about this boat was its ride. No matter how nasty the chop, it’s actually difficult to get wet in a BT3. I’ve never experienced anything like it in the two decades I’ve been fishing the flats. Now for 2013 comes Beavertail’s all new 17 foot Strike. This skiff has almost the same dimensions as their original B2 but its hull is evolved from the BT3. The huge flared bow is not only great looking but just as functional in deflecting spray away from its passengers. 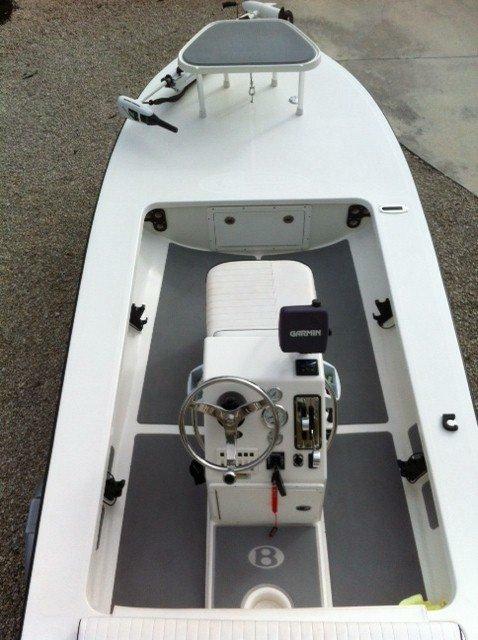 This also gives the Strike a casting deck that’s larger than any other skiff in its class and more than enough room for two anglers to fish side by side. I got to drive the first production Strike this October in Tampa Bay and was thrilled with how it performed. 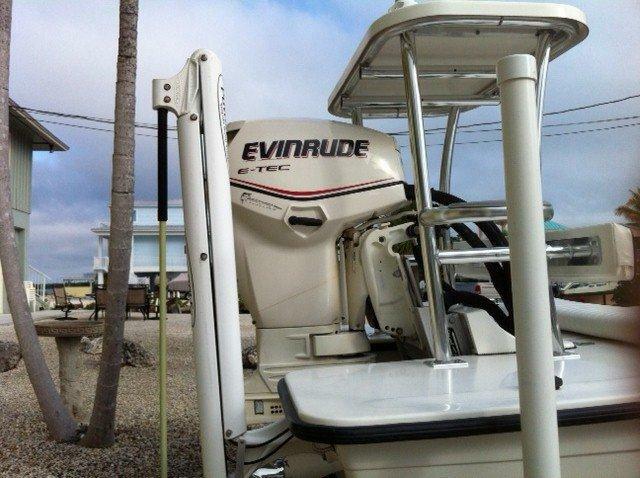 Its hole shot was amazing with just a 60 Evinrude on the back. This was thanks to the unique short sponson hull and a very light Atlas Jack Plate. With the outboard trimmed all the way down and the trim tabs dropped just an inch the Strike jumped right up on plane in only a couple boat lengths. This is hugely important for us here in SW Florida when it comes time to go after tailing redfish during the low tides this time of year. Anglers in Texas and Louisiana will also love being able to jack the motor straight up and run for miles across their ultra-shallow grass flats. The boat’s stern has only 4 degrees of deadrise which means it’s essentially flat. Along with the light weight, this helps to give the Strike a 6 inch draft. A stripped down Lodge Edition with a tiller mounted outboard will float in even less water but still cruise at 30 mph, making it a perfect choice for the Everglades and Ten Thousand Islands. Anglers down in the Keys will probably opt for the full 90 horse option which will let you fly out the Marquesas at close to 40 mph. Poling the Strike was effortless and it reminded me exactly of my old B2. It was easier to stop and turn than my current BT3 and only a bit tippy up on the platform, which is something I expected from a 10 inch narrower beam. Down on the casting deck it felt totally stable and standing on the 11 inch gunnels will give you plenty of room to chase down a zig zagging tarpon at boatside. The storage was also a huge improvement over the older B2 and all the gear for three anglers can easily fit below the deck and in the optional cooler. All of this performance is great but not if it comes at a price that keeps it out of the hands of the average angler, and this is where Beavertail really outdoes the competition. They’re offering a full boat, 60 E-tec motor, and trailer package for the first ten production Strikes at $25,000. Throw 90 horse on the back as well as a shallow water anchor system, trolling motor, and GPS and you’ll still be right around the $30,000 mark for this boat. Most of the competitor’s skiffs in this class will run anywhere from $5000 to $15,000 more. 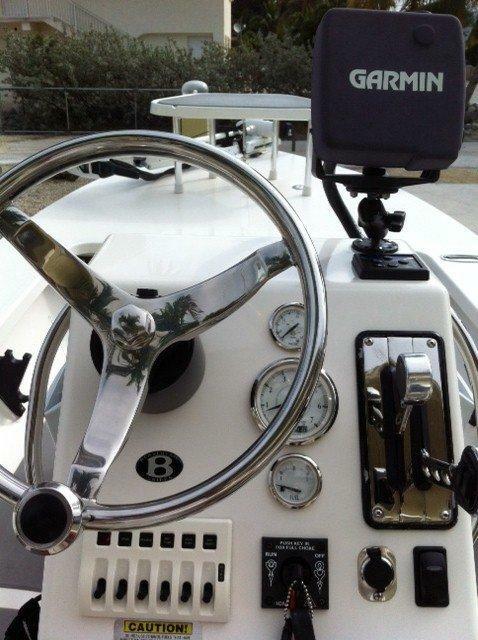 I would have given my right arm for a 90 horsepower Strike when I started fishing in Key West back in the early 1990s. The first technical skiffs were just coming on the market around that time but none of them had all of the Strike’s capabilities. Over the last two decades I’ve owned half a dozen different boats and spent time fishing on almost everything designed for shallow water. 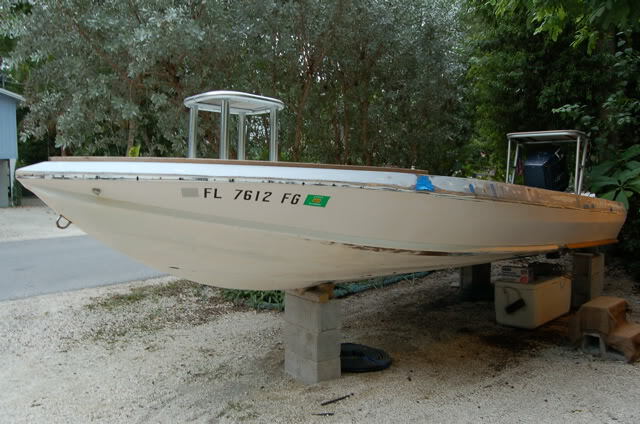 There are a lot of great skiffs out there right now and almost all of them are built in Florida. If I were in the market for a new ride, the Beavertail Strike would be at the top of my list. If you want to see one in person give them a call at 941-705-2090 or stop by the Olde Fish House Marina for the Beavertail Open House next Saturday, December 15th starting at 12 noon. My buddy Tim Gleason is a commercial photographer who splits his time between Pine Island and America's Left Coast. When he's not shooting magazine ads he comes up with some excellent views of our local waters like the image above, something familiar to most residents of Matlacha. This latest print and several others are available at the Earth and Spirt Garden Gallery, a great little spot hidden just south of Pine Island center and well worth the drive. 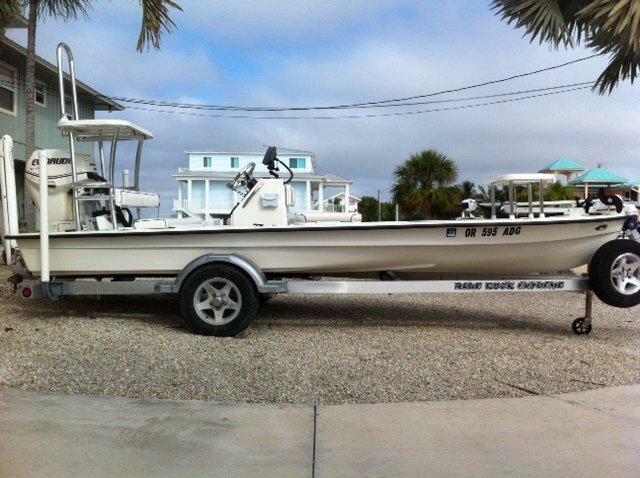 Stop by the Olde Fish House Marina on Matlacha next Saturday, the 15th, starting at 12 noon and you'll get the chance to check out the entire line of Beavertail Skiffs, including the new Strike. The Olde Fish House Marina at 4530 NW Pine Island Road. There will be a handful of skiffs both in and out of the water and owner Elizabeth Leslie will also be on hand to talk pricing and financing. While you're there you can also hear some live music from the band Last Resort and of course there's the Fish House's great local seafood and cold beer to enjoy. This is the second weekend of Aeon/Beavertail's Grand Tour of Florida and the entire Southeast. Their first stop down in the Keys over Thanksgiving was a huge success so they're staying on the road all winter. You can click here on their website to see where they're heading next. December means the return of a lot of good things, like great weather, low tides and especially the snowbird anglers who keep me busy this time of year. Best of all are the big sea trout that take up residence in the potholes covering Pine Island Sound. It's not uncommon to score several of these guys in excess of 20 inches or more by tossing shrimp into any depression you find in the grass flats. They'll also hit slow moving topwater lures and love to eat 1/8th ounce jigs with almost any color of soft plastic, especially white. This shows three negative lows for the Pineland area all happening before 10am the next three days. If you want to catch one on a fly this is exactly what you want to see. Jeana Chambers from Orlando came down to Matlacha and landed her Dr. Seuss Slam while completely outfishing her dad Bill at the same time. It was a slow morning with water temps just below 60 degrees when we set out at 7:30 and it didn't warm up much before lunchtime. This isn't a bad thing in the long run. The reds will get used to the cold very quickly and hard pulling bluefish love the chilly water. Look for big schools of them under the birds in Charlotte Harbor just off Burnt Store bar right now. Bluefish will hit almost anything that moves and they're especially fun on topwater lures. If you've never caught one before watch out for their teeth. You can't tell from that photo above but they have a very serious set of razors in their mouth. Use pliers when you're dehooking them because they're perfectly engineered to remove a fingertip if you're not careful.